Which?, the brand name of the Consumers’ Association, publishes a monthly magazine. In an era of social media, and online reviews, its mix of consumer news and product ratings might seem rather old-fashioned, but it is still (according to its own figures1) Britain’s best-selling monthly magazine. Its rigidly paywalled website means that one must generally subscribe to get at the magazine’s contents. That’s fair enough (although after my grandmother died several years ago, we found piles of unread, unopened even, copies of Which? She had apparently signed up to a regular Direct Debit payment, probably to receive a “free gift”, and had never cancelled it: so one might draw one’s own conclusion about how many of Which?’s readers are regular subscribers for similar reasons). In line with its general “locked-down” approach, Which?’s recent report into the sale of personal data was, except for snippets, not easy to access, but it got a fair bit of media coverage. Intrigued, I bit: I subscribed to the magazine. This post is not about the report, however, although the contents of the report drive the irony of what happened next. 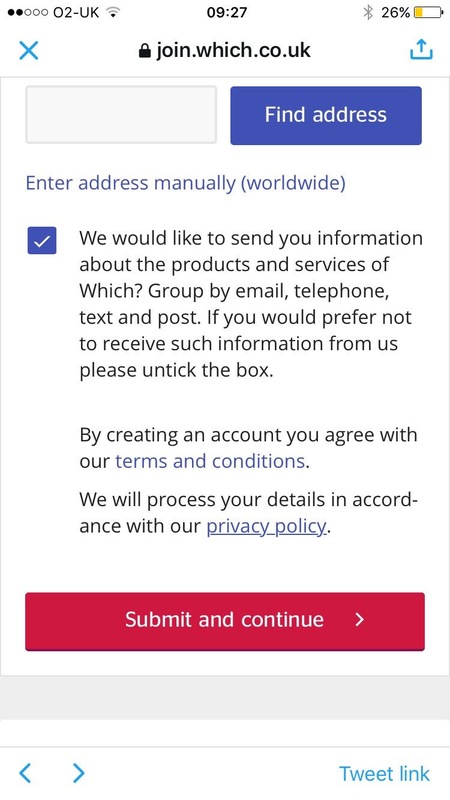 Some organisations provide pre-ticked opt-in boxes, and rely on the user to untick it if they don’t want to consent. In effect, this is more like an opt-out box, as it assumes consent unless the user clicks the box. A pre-ticked box will not automatically be enough to demonstrate consent, as it will be harder to show that the presence of the tick represents a positive, informed choice by the user. The Article 29 Working Party goes further, saying in its opinion on unsolicited communications for marketing purposes that inferring consent to marketing from the use of pre-ticked boxes is not compatible with the data protection directive. By extension, therefore, any marketing subsequently sent on the basis of a pre-ticked box will be a contravention of the data protection directive (and, in the UK, the Data Protection Act 1998) and the ePrivacy directive (in the UK, the Privacy and Electronic Communications (EC Directive) Regulations 2003 (PECR)). Nothwithstanding this, I certainly did not want to consent to receive subsequent marketing, so, as well as making a smart-arse tweet, I unticked the box. 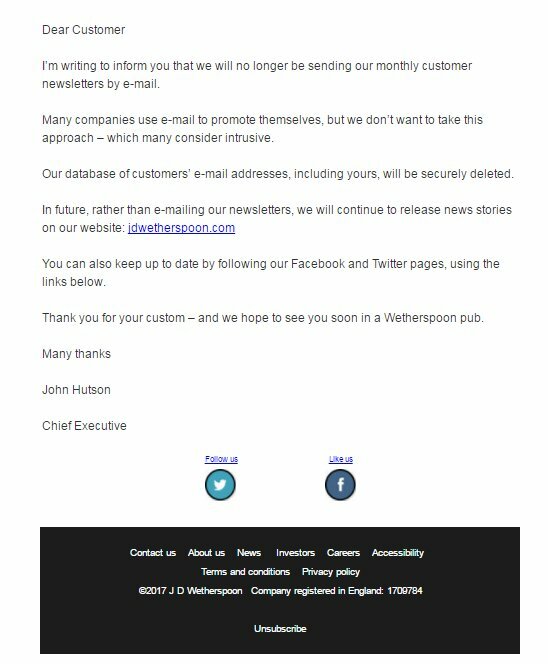 However, to my consternation, if not my huge surprise, I have subsequently received several marketing emails from Which? They do not have my consent to send these, so they are manifestly in contravention of regulation 22 of PECR. It’s not clear how this has happened. Could it be a deliberate tactic by Which? to ignore subscribers’ wishes? One presumes not: Which? says it “exists to make individuals as powerful as the organisations they deal with in their daily live” – deliberately ignoring clear expressions regarding consent would hardly sit well with that mission statement. So is it a general website glitch – which means that those expressions are lost in the sign-up process? If so, how many individuals are affected? Or is it just a one-off glitch, affecting only me? Let’s hope it’s the last. Because the ignoring or overriding of expressions of consent, and the use of pre-ticked boxes for gathering consent, are some of the key things which fuel trade in and disrespect for personal data. The fact that I’ve experience this issue with a charity which exists to represent consumers, as a result of my wish to read their report into misuse of personal data, is shoddy, to say the least. We have noted all of your comments relating to new Which? members signing up, including correspondence received after sign-up, and we are considering these in relation to our process. I appreciate the response, although I’m not sure it really addresses my concerns. But a recent case in the Scottish Sheriff Court shows that CCTV and data protection can also have relevance in private law civil proceedings. In Woolley against Akbar  ScotsSC 7 the husband and wife pursuers (equivalent to claimants in England and Wales) successfully brought a claim for compensation for distress caused by the defender’s (defendant in England and Wales) use of CCTV cameras which were continuously recording video and audio, and which were deliberately set to cover the pursuers’ private property (their garden area and the front of their home). Compensation was assessed at £8634 for each of the pursuers (so £17268 in total) with costs to be assessed at a later date. Two things are of particular interest to data protection fans: firstly, the willingness of the court to rule unequivocally that CCTV operated in non-compliance with the DPA Schedule One principles was unlawful; and secondly, the award of compensation despite the absence of physical damage. any precautions to ensure that coverage of the pursuers’ property was minimised or avoided. The cameras to the front of the house record every person approaching the pursuers’ home. The cameras to the rear were set deliberately to record footage of the pursuers’ private garden area. There was no legitimate reason for the nature and extent of such video coverage. The nature and extent of the camera coverage were obvious to the pursuers, as they could see where the cameras were pointed. The coverage was highly intrusive…the defender also made audio recordings of the area around the pursuers’ property…they demonstrated an ability to pick up conversations well beyond the pursuers’ premises. There are four audio boxes. The rear audio boxes are capable of picking up private conversations in the pursuers’ rear garden. Mr Akram, on one occasion, taunted the pursuers about his ability to listen to them as the pursuers conversed in their garden. The defender and Mr Akram were aware of this at all times, and made no effort to minimise or avoid the said audio recording. The nature of the coverage was obvious to the pursuers. Two audio boxes were installed immediately below front bedroom windows. The pursuers feared that conversations inside their home could also be monitored. The said coverage was highly intrusive. Although, after the intervention of the ICO, the defender realigned the camera at the rear of the property, Sheriff Ross held that the coverage “remains intrusive”. Fundamentally, the sheriff held that the CCTV use was: unfair (in breach of the first data protection principle); excessive in terms of the amount of data captured (in breach of the third data protection principle); and retained for too long (in breach of the fifth data protection principle). The sheriff noted that, by section 13(2) of the DPA, compensation for distress can only be awarded if the pursuer has suffered “damage”, which was not the case here. However, the sheriff further correctly noted, and was no doubt taken to, the decision of the Court of Appeal in Vidal-Hall & Ors v Google  EWCA Civ 311 in which the court struck down section 13(2) as being incompatible with the UK’s obligations under the European data protection directive and the Charter of Fundamental Rights (my take on Vidal Hall is here). Accordingly, “pure” distress compensation was available. Although the facts here show a pretty egregious breach of DPA, it is good to see a court understanding and assessing the issues so well, no doubt assisted in doing so by Paul Motion, of BTO Solicitors, who appeared for the pursuers. One niggle I do have is about the role of the ICO in all this: they were clearly apprised of the situation, and could surely have taken enforcement action to require the stopping of the CCTV (although admittedly ICO cannot make an award of compensation). It’s not clear to me why they didn’t. Right of access to data about oneself is recognised as a fundamental right (article 8(2) of the Charter of Fundamental Rights of the European Union*). Section 7 of the UK’s Data Protection Act 1998 (DPA) gives expression to this, and provides that as a general right individuals are entitled to be told whether someone else is processing their data, and why, and furthermore (in terms) to be given a copy of that data. The European General Data Protection Regulation retains and bolsters this right, and recognises its importance by placing it in the category of provisions non-compliance with which could result in an administrative fine for a data controller of up to €20m or 4% of turnover (whichever is higher). So subject access is important, and this is reflected in the fact that it is almost certainly the most litigated of provisions of the DPA (a surprisingly under-litigated piece of legislation). Many data controllers need to commit significant resources to comply with it, and the Information Commissioner’s Office (ICO) produced a statutory code of practice on the subject in 2014. But it is not an absolute right. The DPA explains that there are exemptions to the right where, for instance, compliance would be likely to prejudice the course of criminal justice, or national security, or, in the case of health and social care records, would be likely to cause serious harm to the data subject or another person. Additionally the DPA recognises that, where complying with a subject access request would involve disclosing information about another individual, the data controller should not comply unless that other person consents, or unless it “is reasonable in all the circumstances to comply with the request without the consent of the other individual” (section 7(4) DPA). The CCTV owner must provide you with a copy of the footage that you can be seen in. They can edit the footage to protect the identities of other people. The latter sentence is true, and especially in the case where footage captures third parties it is often appropriate to take measures to mask their identities. But the first sentence is simply not true. And I think it is concerning that “the best place to find government services and information” (as gov.uk describes itself) is wrong in its description of a fundamental right. But there are others – and the ICO has an excellent resource explaining them. What I don’t understand is why the gov.uk page fails to provide better (accurate) information, and why it doesn’t provide a link to the ICO site. I appreciate that the terms and condition of gov.uk make clear that there is no guarantee that information is accurate, but I think there’s a risk here that data subjects could gather unreasonable expectations of their rights, and that this could lead to unnecessary grievances or disputes with data controllers. Gov.uk invite comments about content, and I will be taking up this invitation. I hope they will amend. Any Safe Harbor in a storm…? The ICO has contacted me to say that it actually selected SnapSurveys because they offered clients the option of hosting survey response on UK servers, and it has checked with SnapSurveys that this remains the case. I’ve been pointed me to http://www.snapsurveys.com/survey-software/security-accessibility-and-professional-outline/ which confirms this point. Is the ICO making unlawful transfers of personal data to the US? I’m pleased to confirm, appears to be “no”. Earlier this week the Information Commissioner’s Office (ICO) published a blogpost by Deputy Commissioner David Smith, entitled The US Safe Harbor – breached but perhaps not destroyed! businesses in the UK don’t have to rely on Commission decisions on adequacy. Although you won’t get the same degree of legal certainty, UK law allows you to rely on your own adequacy assessment. Our guidance tells you how to go about doing this. Much depend [sic] here on the nature of the data that you are transferring and who you are transferring it to but the big question is can you reduce the risks to the personal data, or rather the individuals whose personal data it is, to a level where the data are adequately protected after transfer? The Safe Harbor can still play a role here. We collect information volunteered by members of the public about nuisance calls and texts using an online reporting tool hosted by Snap Surveys. This company is a data processor for the ICO and only processes personal information in line with our instructions. This does not unambiguously say that SnapSurveys are transferring the personal data of those submitting reports to the ICO to the US under Safe Harbor – it is possible that the ICO has set up some bespoke arrangement with its processor, under which they process that specific ICO data within the European Economic Area – but it strongly suggests it. It is understandable that a certain amount of regulatory leeway and leniency be offered to data controllers who have relied on Safe Harbor until now – to that extent I agree with the light-touch approach of the ICO. But if it is really the case that peoples’ personal data are actually being transferred by the regulator to the US, three weeks after the European Commission decision of 2000 that Safe Harbor provided adequate protection was struck down, serious issues arise. I will be asking the ICO for confirmation about this, and whether, if it is indeed making these transfers, it has undertaken its own adequacy assessment. We have carried out thorough searches of the information we hold and have identified one instance where a member of the public raised concerns with the ICO in September 2014, about the alleged processing of personal data by Blackpool FC. We concluded that there was insufficient evidence to consider the possibility of a s55 offence under the Data Protection Act 1998 (the DPA), and were unable to make an assessment as the individual had not yet raised their concerns with Blackpool FC direct. We therefore advised the individual to contact the Club and to come back to us if they were still concerned, however we did not hear from them again. As such, no investigation took place, nor was any assessment made of the issues raised. This suggests the ICO appears wrongly to consider itself unable to undertake section 42 assessments under the Data Protection Act 1998 unless the data subject has complained to the data controller – a stance strongly criticised by Dr David Erdos on this blog, and one which has the potential to put the data subject further in dispute with the data controller (as I can imagine could have happened here, with a family some of whose members are ready to sue to protect their reputation). It also suggests though that maybe people weren’t quite as interested as the page views suggested. Nonetheless, I am posting this brief update, because a few people asked about it.